Ted Cruz's Texas Opponent: No, Seriously, I Want to Impeach Trump. Also, I'm Against That Pro-ICE Resolution. 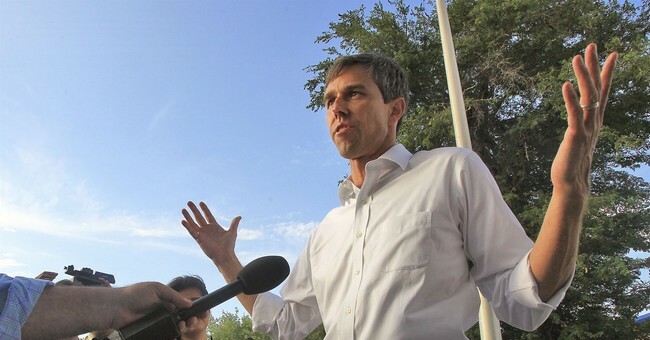 Rep. Beto O'Rourke (D-Texas) said on Tuesday that President Trump's performance at a controversial news conference with Russian President Vladimir Putin warrants impeachment – and that he would vote to do so. "Standing on stage in another country with the leader of another country who wants to and has sought to undermine this country, and to side with him over the United States - if I were asked to vote on this I would vote to impeach the president," O'Rourke said, according to The Dallas Morning-News. "Impeachment, much like an indictment, shows that there is enough there for the case to proceed and at this point there is certainly enough there for the case to proceed," he added. The Cruz campaign shot back by asserting that O'Rourke's stance on impeachment makes him "so radical and reckless that he is unfit to serve in the U.S. Senate." "He is the only major party candidate in America to call for impeachment. Elizabeth Warren hasn't done it. Bernie Sanders hasn't done it. Nancy Pelosi hasn't done it. This is a fringe candidate in the Democrat Party," Cruz campaign manager Jeff Roe said Tuesday afternoon...Cruz later retweeted this story and used it to hit his rival. "This partisan extremism may resonate great in Hollywood, but it doesn't reflect the views of the majority of Texans," he wrote. And just in case anyone still might mistake him for a centrist or moderate, O'Rourke went out of his way to eschew House Democratic leadership's recommendation that their members vote "present" on a pro-ICE resolution, opting instead to join a few dozen committed leftists (plus a gadfly libertarian) in voting "no:"
O'Rourke isn't crazy or stupid, so he's clearly making intentional decisions to relegate himself to the far-left 'resistance' flank of his party -- despite the fact that this course of action conflicts with his (ostensible) immediate task of getting elected in a red state. Trump isn't super popular in Texas, but he's above water and more popular than the Democrats, and Texans aren't likely to be excited about removing him from office. The latest poll, released earlier this month, has Cruz leading by nine points, which is right in line with June's CBS survey (Cruz +10) and May's Q-poll (Cruz +11). The state's GOP governor is also comfortably ahead. So what is Beto's game here? My suspicion: He's looked at the public and internal polling and concluded that he's got almost no chance of actually winning this race, so he made a calculated decision fairly early on to run aggressively to the left, in order to become a resistance darling (Cruz is an easy foil for that) and raise a boatload of money (which he has). He's betting that the only way he might win is if a very tall blue wave sweeps across the country, in which case policy particulars may not matter as much as basic party affiliation. If he can spend a ton of cash driving Cruz's numbers down, that might be just enough to sufficiently shift the turnout model to the point that he could plausibly benefit from an outlier wave scenario. But barring a shocker, he'll still be able to point to his close-ish defeat as "proof" that Texas is tilting purple -- hopefully avoiding a Wendy Davis-style wipeout, thanks to the anti-GOP nature of the cycle. And having "bravely" embraced a left-wing agenda, he'll have ingratiated himself with the party's base while raising his grassroots profile nationwide.